Jeff Gordon Chooses Our Hanging Wooden Letters! 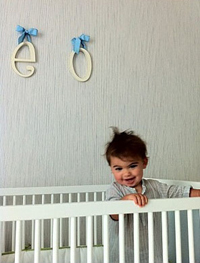 Nascar driver Jeff Gordon has New Arrivals Wooden Hanging Letters in his son, Leo Benjamin's nursery! Jeff & his wife Ingrid choose our solid blue ribbon for hanging to coordinate with baby Leo's nursery. Our wooden hanging letters are a great way to personalize your child or baby's room. Choose from an assortment of ribbons for hanging!